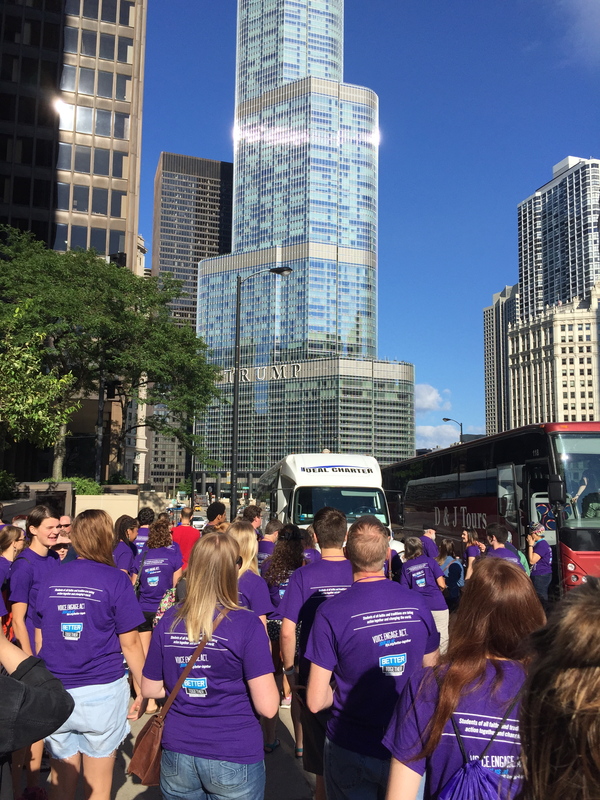 For the past three years I have sent or accompanied students to an Interfaith Leadership Institute in Chicago led by Eboo Patel’s Interfaith Youth Core. As the Chaplain of a religiously diverse college, I am passionate about fighting rampant Islamophobia and fear of the “other” through positive experiences of interfaith cooperation. But I questioned whether I needed to go to this year’s ILI myself. It’s difficult to be away from my family and the two students I was sending were fully capable of negotiating the conference by themselves. Right before registration closed, though, I decided to attend because I wanted to support my students, Angela and Diana, in their experience. It wasn’t until I boarded my Amtrak train headed to Chicago and reviewed the conference schedule that I realized this ILI would be different from others. On Saturday morning we were scheduled to participate in a march, organized by the Inner-City Muslim Action Network (IMAN), memorializing Martin Luther King’s first protest in Chicago. On Friday evening, Eboo Patel spoke to us about this march and its historical significance. King moved to Chicago in January of 1966 to highlight the issues of inner-city poverty and the city’s real estate practices that trapped people in rundown housing and overcrowded schools. On August 5th, 1966, King and seven hundred non-violent protestors gathered to march into Marquette Park on the southwest side of Chicago—a neighborhood off limits to African American residents due to racist red-lining practices. Of this march King later reported, “I’ve been in many demonstrations all across the South, but I can say that I have never seen—even in Mississippi and Alabama—mobs as hostile and hate-filled as I’ve seen here in Chicago.” Five thousand screaming, bottle-and-brick-throwing, hate-spitting counter-protestors met King and his marchers along the route to Marquette Park, yelling at them to “Go home!” At one point, King was struck in the head by a brick and the blow brought him to his knees. Several eyewitnesses reported that, after taking a moment to recover, King stood back up to march again without a hint of hatred on his face. 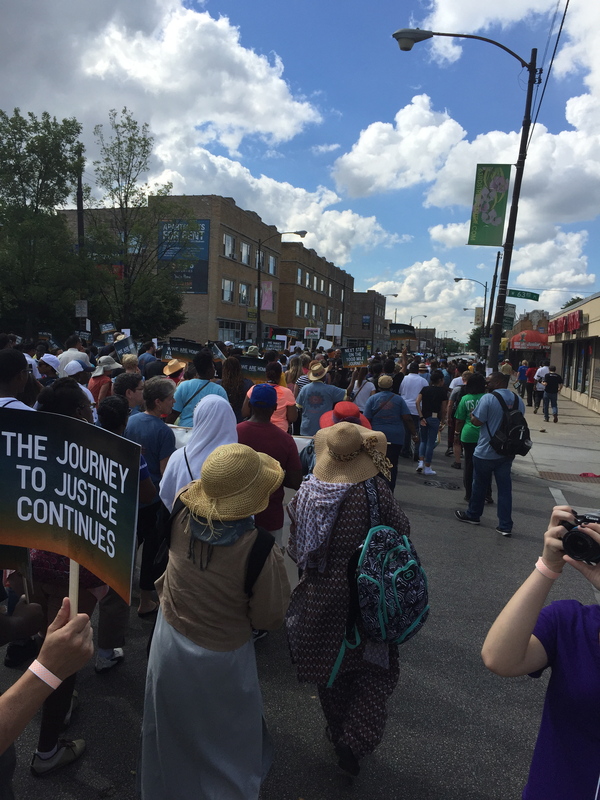 So last Saturday, August 6th I was transported, along with 250 other attendees of IFYC’s Interfaith Leadership Institute, by bus to the same southwest Chicago neighborhood where King and his protestors gathered to march. I honestly did not know what to expect when I got off the IFYC bus and I admit that my mind wasn’t completely on history. I had forgotten my sunblock and was concerned about the exposure. The new purple t-shirt all ILI conferees were asked to wear was annoyingly itchy and after two large cups of coffee, I was worried about finding a bathroom along the route. These concerns remained as our purple-shirted crew of 250 interfaith leaders hung together in the middle of the street behind a gathered crowd of about a thousand. We had been told to stay together and didn’t really know what else to do. But then I heard someone speaking on a microphone too far away to see. The voice sounded familiar so I decided to break rank, grab Angela and Diana and move up in the crowd to see who was speaking. 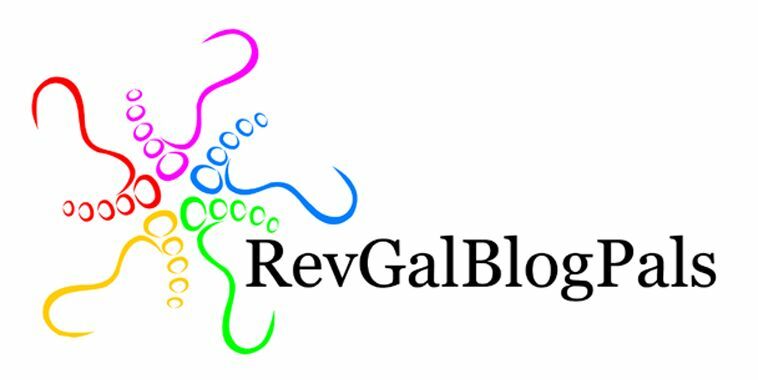 We didn’t have to move up far, though, before I realized it was Rev. Jesse Jackson at the microphone. I have not always appreciated Rev. Jackson’s political moves or aspirations, but when I saw him there in person it was like seeing civil rights history brought to life. “Oh my gosh, that’s Jesse Jackson!” I shouted excitedly to Angela and Diana as I suddenly became aware of the significance of the march to which we had been bussed. A need to share what I was seeing, hearing and experiencing overcame me. I pulled out my Iphone and updated my Facebook status, “Getting ready to march in honor of MLK in Chicago!” I took photos of the crowd that I noted to be incredibly diverse: Muslim parents carrying toddlers on their shoulders, Catholic Latinos marching behind their church’s banner, Jewish rabbis with a cohort of students, black gospel groups and African drummers, proud members of the LGBTQ community. People carried signs that read, “We are home!” and “The journey to justice continues.” I took as many pictures as possible, marching with my phone in the air, snapping photo after photo of the crowd that spanned two or three blocks before and behind me. I wanted—needed—to capture the magnitude and mood of the moment. 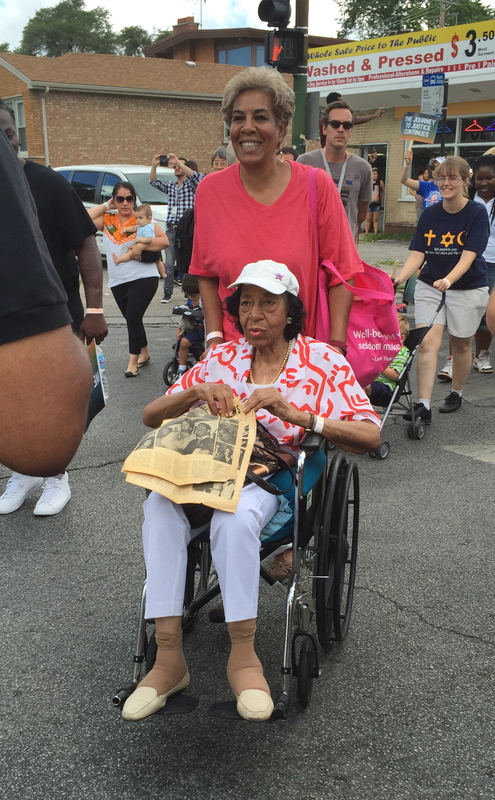 About halfway through the march I noticed an elderly woman being pushed in a wheelchair. Reporters and photographers swarmed her and asked her to hold up an old, yellowed newspaper that she was carrying carefully in her hands. The woman marching beside me noticed my curiosity and leaned over to tell me this woman and the daughter pushing her wheelchair both marched with King fifty years ago. The newspaper must have been a report of the protest that she had saved all these years. I watched them both for a while. In spite of the sun and 80 degree heat that was beginning to dampen my enthusiasm, these two women looked radiant, beaming with joy and pride. Fifty years ago the daughter was only twelve, I learned, and the heat of Chicago was even more intense. They were hit with bricks, separated from each other, arrested, and loaded into different paddy wagons. Yet here they were, still marching, in 2016. Hot and exhausted by the time the march ended, I got back on the bus looking forward to lunch at our beautiful, air-conditioned hotel. I was more attentive, though, to the changing city landscape as we left the south side. Liquor stores, low-rent apartments, a man selling mangos and avocados out of the back of a truck slowly faded into the opulence and architectural beauty of a high rise, high rent downtown. Leaning my head against the window, I contemplated the mother and daughter from the march and all those who put their bodies on the line for justice. To be in solidarity with the oppressed requires such a bodily “being with” stance. It also requires a willingness to take risks. I wondered to myself if being bussed to a march I would not have attended had I not registered for an interfaith conference would qualify as solidarity. The nagging question of “Did I deserve to be there?” plagued my mind, but it did not ruin the power of the experience. Instead, these thoughts of “deservedness” were subsumed by the grander spirit of generosity and prophetic sense of welcome I felt during the day. Even those who bore hate in their hearts were treated generously. In his speech during the rally, Rev. Jesse Jackson said of the counter-protestors who met them in 1966, “They weren’t bad people. They were just badly taught.” And Eboo Patel, in his speech to us the night before, quoted the French poet Aime Cesaire, who wrote, “There is room for all of us at the rendezvous of destiny.” I was welcomed into a glimpse of that destiny during this Saturday march. It didn’t matter to anyone why I had come. It just mattered that I was there. And being there gave me a taste of who we could be and what we could accomplish if such a generous, prophetic welcome were extended to all. In a day when hateful rhetoric is on the rise and divisions between class, race, sexual orientation, and religious affiliation run deep, experiences such as this remind me that our brokenness does not have to be our reality. 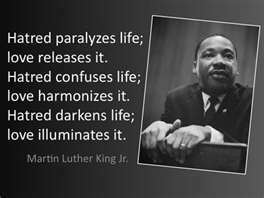 Experiences such as this lift up God’s vision for us of beloved community and set my feet marching towards this as our destiny.